You can now play with 5 or 6 and with new rules! Chicken Yard Rumba!! 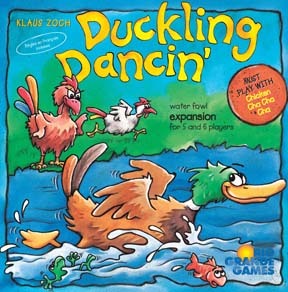 The chickens are no longer dancing alone - the water-based fowl have decided to join in the fun! Not only do the chickens now compete with the ducks in the olympic dance trials, but there are now squishy obstacles to their quest to collect all the feathers. Otherwise, the game is the same fun as the original, but watch your step or you will need to clean your feet!